As specialists in Cherry Picker Hire in Portsmouth and the surrounding area, MC Property Maintenance offer a range of services designed to suit individual client needs. We provide expert operators for hire where needed in addition to self hire vehicles depending on the needs of your specific projects as well as cherry pickers available for both long term and short term hire. MC Property Maintenance draws from extensive local experience in order to help clients choose the right cherry picker for the job, whether you are conducting general residential maintenance, or embarking on a large scale commercial renovation. Our Cherry Picker hire in Portsmouth provides a cost-effective, swifter and safer alternative to scaffolding for many construction and decoration projects. Ideal for use on the exterior or even the interior of a property, cherry pickers can also be used when conducting necessary painting works, making them ideal for refurbishment and renovation projects. They can also be used in a multitude of locations, from churches to shopping centres and everywhere in between. Over the years, MC Property Maintenance has built up an established reputation for providing clients with a wide range of first class high-level access platform machinery to suit any decorating or construction project. From small businesses and personal DIY projects to providing expert management and organisation solutions in commercial decorating projects for larger businesses, MC Property Maintenance can help. MC Property Maintenance is also officially registered with the IPAF and CPA, giving you peace of mind in the quality of our vehicles and operatives at all times. As such, we draw from a wealth of local experience in order to continue to exceed client expectations in every decorating project we undertake. Self Hire – MC Property Maintenance provides our self hire service for both long term and short term projects. A member of our professional team will personally deliver the vehicle to your site, staying in order to ensure that you are fully assisted in becoming familiar with the machine. MC Property Maintenance provides the TRACCESS 170, EASYLIFT R-160, CTE-ZED 21, EASYLIFT R-180 and the EASYLIFT R-150 available for hire. Operated Hire – Our team of trained operatives will be on hand to provide expert advice and assistance throughout any project with our operated hire service. Available to clients across Portsmouth and throughout the entire South East, MC Property Maintenance provides this service as a cost effective solution to long term construction and decorating projects. Property Maintenance – In addition to operated hire and self hire cherry pickers, MC Property Maintenance also provides a number of additional property related services. It is important to maintain your residential or commercial property, particularly where insurance is concerned. With a number of services offered including gutter cleaning, the treating of woodwork and more, MC Property Maintenance help clients keep their property looking as new. For a wide range of cherry pickers for hire in Portsmouth and the surrounding area, or to find out more about long term and short term self hire options from MC Property Maintenance, get in touch with us today. Simply call us on 01243 262714 and speak to a member of our professional team, or fill out the enquiry form below or on the sidebar to the right and we will get back to you. 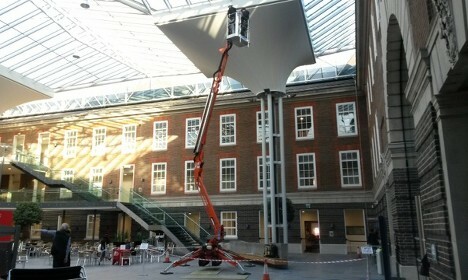 We hope to hear from you soon for helpful advice on cherry picker hire in Portsmouth.